The Voortrekker Monument is a massive granite structure that was built to commemorate the Great Trek of the Afrikaners that took place between 1835 and 1854 led by Piet Retief. It is located on the top of Monument Hill, which is visible from a number of locations in Pretoria. At the centre of the monument is a red granite Cenotaph. An opening in the dome has been astronomically aligned such that at noon on the 16 December (the Day of the Covenant) the rays of the sun land upon the Cenotaph, lighting up the words, ""Ons vir jou, Suid-Afrika"". In the Hall of Heroes a frieze consisting of 27 marble panels extends for 92m, depicts the major events of Great Trek. The perimeter of the building is surrounded by a wall with a laager of 64 granite ox-wagons carved into the wall, which represent the wagon laager of Blood River, where the famous battle between the Afrikaners and the Zulus took place. Ox wagon rides are available at the Voortrekker Monument. This will make a wonderful event for school groups, corporate functions, family reunions, or tourism groups. Contact Alwyn at 082 920 5413 for bookings and prices. 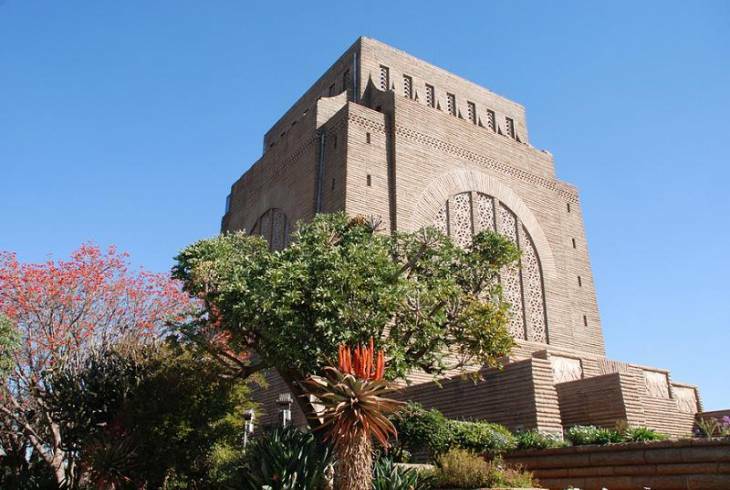 Voortrekker Monument Heritage Site Information and Nearby Accommodation.